If you've ever dreamt of being behind the wheel of a 600 horsepower Sprint Cup style stock car, the Richard Petty Driving Experience can make your dreams come true. The track is located next to the Magic Kingdom Parking lot. If driving, enter the Magic Kingdom toll plaza towards the left and turn left at the Walt Disney World Speedway sign. When using Disney transportation, take the Richard Petty Driving Experience Shuttle from the Ticket and Transportation Center which picks up next to the Magic Kingdom Kennel. The shuttle begins operation at 8:00am and ends at 4:00pm. It runs every 20 to 25 minutes. The track is located next to the Magic Kingdom Parking lot. Please note that all programs are subject to close if the weather is inclement. Call ahead to verify that the track is open. Booking this experience at the beginning of your vacation that way it allows time for a reschedule later on your trip. Florida is notorious for crazy weather patterns. Remember there is little to NO shade, loud engines and fumes. Keep all that in mind when bringing along small children. William Perry talks about his Rookie Experience at Disney! 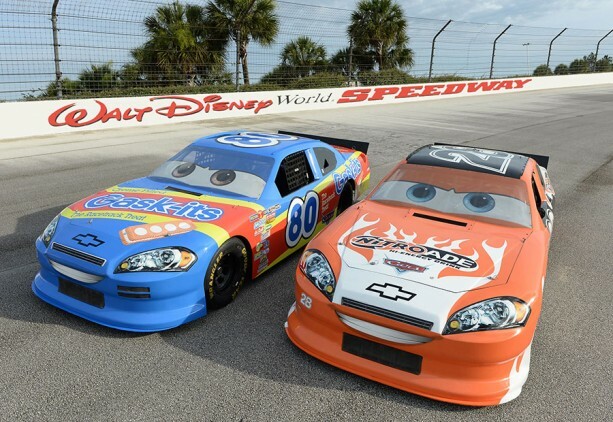 The Richard Petty Driving Experience has teamed up with Pixar Animation Studios to bring two Cars characters to life! Aiken Axler and Sage VanDerSpin are two full-size, 600HP, custom character cars available for kids to ride in during the Piston Cup Junior Ride-Along program. VanDerSpin, #80, races for Team Gask-its and is the youngest member of the Junior Piston Cup Pro Series. Axler, #28, is a Nitroade Racer who won the Vitoline Rookie of the Year award. The cars have a window wrap on them so you can see the character's eyes from the outside, but it doesn't obscure viewing from the inside. Like the other junior ride-alongs, a special seat has been created so the cars are safe for younger children. The price is $59 and is available for children ages 6-13. Adults will no longer be the only guests able to fulfill their stock car driving dreams - the Richard Petty Driving Experience is now offering "Junior Ride-Alongs" at the Walt Disney World Speedway. Children who are at least 48 inches tall and under 14 years old will get to ride in the passenger seat of a real NASCAR race car for three laps around the track with a professional driving instructor. The Richard Petty Driving Experience is working is conjunction with The Joie of Seating to make sure that kids will fit perfectly in the cars' seats and be safe and secure at the same time. This company makes custom-fitted aluminum racing seats, featuring built-in shoulder and head protection, as well as a five-point safety harness. Two-time NASCAR Nationwide series champion Randy LaJoie owns the company and says his 10 years of experience in designing custom racing seats will ensure the children will have the safest and most fun ride possible. The Junior Ride-Alongs are $59 and no reservations are required.